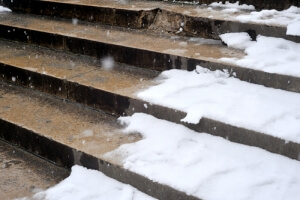 Denver personal injury attorneys explain property owners’ responsibilities to remove snow & ice to prevent fall hazards. Two days ago it was snowing, but yesterday was sunny and pleasant, so of course today it’s freezing cold again. Welcome to Colorado – be careful of the ice. But what if you do hit a slick spot of black ice and lose it, are you responsible for your own medical bills? If someone falls on your property could you be responsible for theirs? Under Colorado’s Premises Liability Act (PLA) private property owners, managers, and vendors can all be held liable for injuries caused by “known dangers” that occur on property they own or control if they fail to exercise “reasonable care.” The definition of reasonable care differs depending on who you are. What is reasonable care for a trespasser (someone who enters or remains on the land of another without consent) is different than that of someone who is on the property as an “Invitee” (person entering the property for a business transaction or because the property is open to the public) or a “Licensee” which include social guests. Public roadways and sidewalks are property of the State and generally immune from being sued in most instances. A trespasser can only collect for damages that are willfully or deliberately caused by the landowner (so that bobby-trap you’ve been thinking about setting for the neighbor kids taking a shortcut through your backyard – is a really bad idea). Meanwhile, landowners have a duty to warn Licensees of dangerous conditions (either created or on the land) which the landowner knows about. Invitees (usually customers) are owed the same duty as Licensees except the land owner does not need to have actual knowledge of the danger, he only should have known of the dangerous condition on his property. Businesses and residential housing complexes have a duty to keep walkways and parking lots safe from icy and dangerous conditions. That includes removing snow, putting salt down, and ensuring that melting water isn’t draining into areas where it can refreeze and injure people. Unfortunately, falls still happen even when the upmost precautions have been taken, however, there are many instances when these falls could have easily been prevented. These falls can lead to serious and sometimes permanent injuries. If you’ve been injured by the negligence, laziness, or indifference of a commercial property owner, then you need an experienced injury attorney at your side. At the Law Offices of Bell & Pollock we have a team of experienced Denver personal injury attorneys ready to go to work for you. Call us today to set up your free, no-obligation consultation.